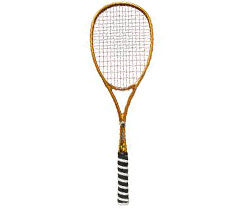 Black Knight Ion racquets use Nano-Crystalline Technology (NCT) as an additive to the polymer structure of the graphite frame, for reinforcement at key stress points while allowing for finetuning of the weight and balance. The combination of NCT with the Ion frame geometry also effectively reduces frame distortion and torque for a larger sweetspot and greater control for hard hitters. The shaft is flared in 2 dimensions between the bridge and the handle to create a progressive flex, increasing power transfer. Used and designed by 4 time British Open Champion David Palmer the Ion Storm is designed for advanced to professional players.